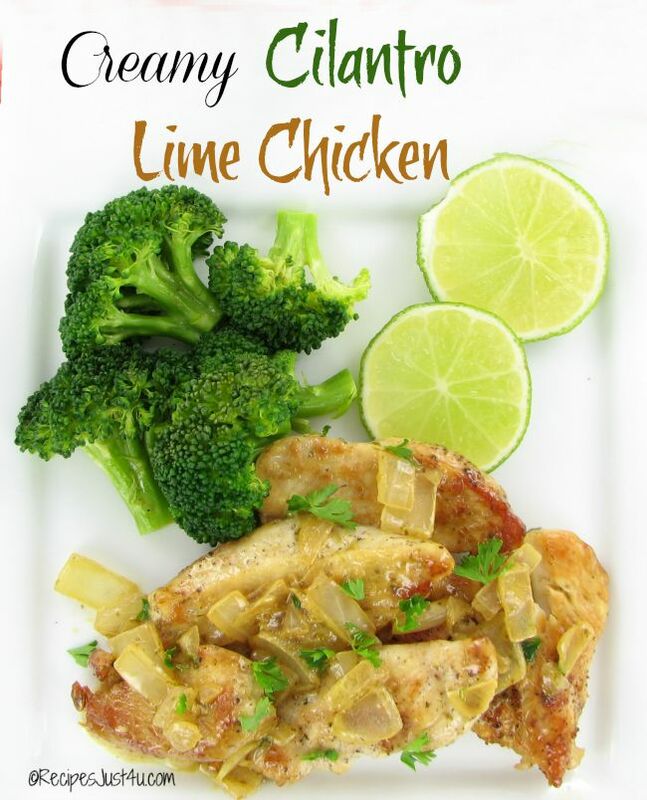 30 Minute Meal – Creamy chicken with Cilantro Lime Sauce. Today, I am going to show you how one pan, a few ingredients and lots of love will take some plain ole chicken tenders into something really special. It is creamy and buttery with a hint of cilantro and the taste is to die for. I love the way this dish comes together so quickly. Just brown those chicken tenders for a while and get your other ingredients going while they cook. I used a fat free chicken broth to keep the calories down. That way, I didn’t mind using a teeny bit of cream. Heavy cream makes all the difference to this dish. Skim milk just won’t cut it. TIP: Have you discovered that you have no heavy cream on hand? Try making your own heavy cream with just two ingredients in seconds. One of the secrets to the sauce is the delicious caramelized onions. 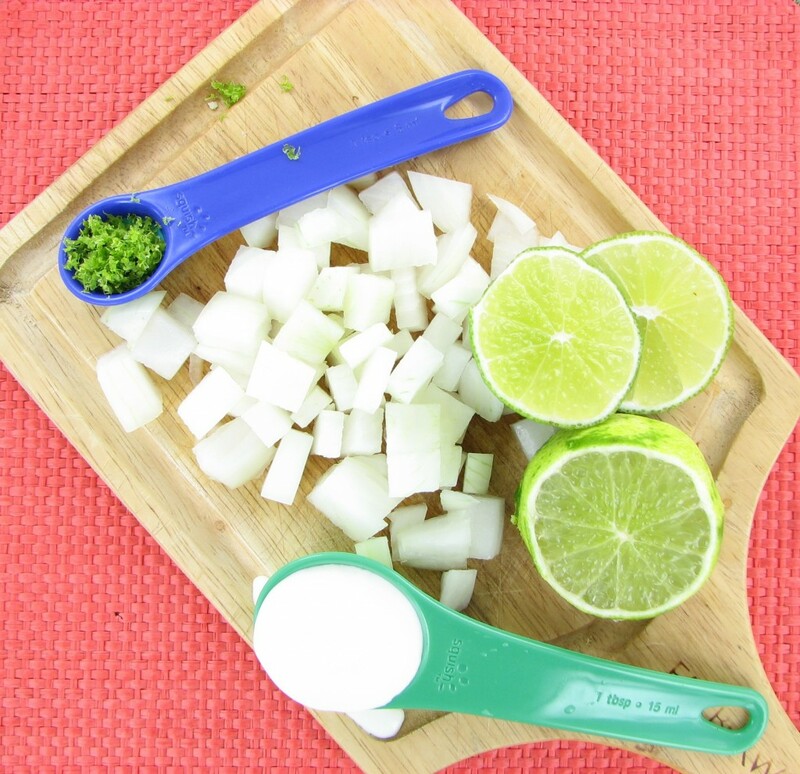 They get so sweet and taste wonderful with the cilantro and lime. Trust me. It will be all you can do not to lick the sauce right off the plate! 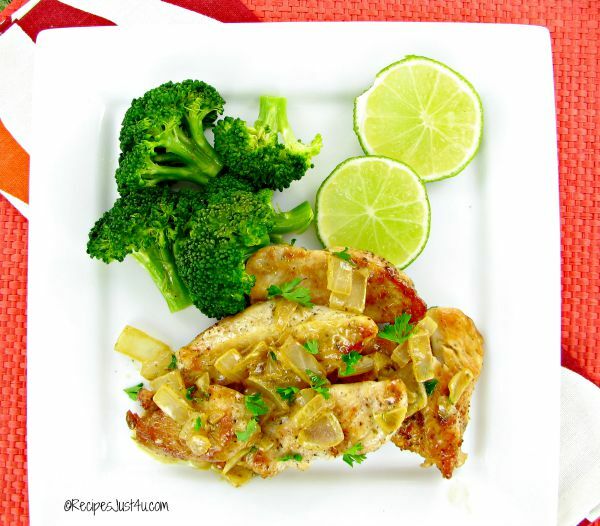 Serve the chicken with some lime rounds and steamed broccoli. And don’t be surprised if your family asks you to make this again and again. Which is not a problem, since it only takes 20 minutes from start to finish. Don’tcha just love easy peasy? No one will be saying this is “just chicken for dinner” after this meal. No way, no siree! Sprinkle the chicken tenders with Kosher salt and cracked black pepper. In a frying pan, heat the oil over medium-high heat. Add the chicken and cook for about 10 minutes, turning once until the chicken is lightly browned and no longer pink inside. Set aside while you prepare the sauce. Put the onions in the same pan, and cook them gently using a spatula to scrape up the browned bits from the bottom. Get the onions nice and caramelized and then add the broth, lime juice, lime zest,, and cilantro. Turn the heat to medium and cook, bringing the mixture to a boil. Continue to boil gently, uncovered, for 10 minutes or until the liquid is reduced to around ¼ cup. Reduce the heat to medium-low, and add the cream and butter. Stir until butter has melted. Return the chicken to the pan and coat both sides with the sauce. Cook over a medium low heat until it is thoroughly cooked, another 2 minutes or so. 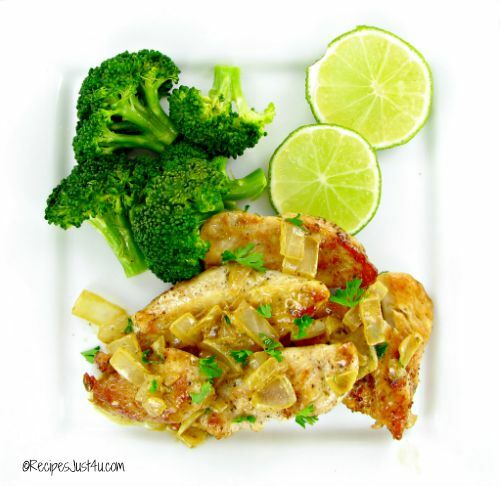 Spoon the sauce over the chicken and garnish with lime wedges and fresh parsley.